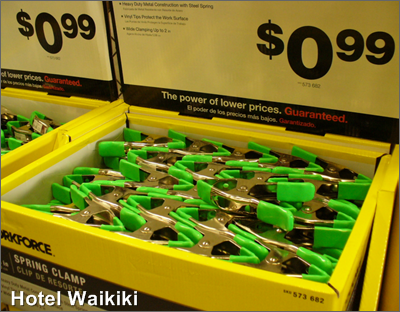 Large size spring clamps were on sale at Home Depot for 99¢ each. I bought 4 spring clamps to use for something that I'll think of later like hanging clothes on the lanai railing, but be glad that I bought the spring clamps then. It's called being proactive. It's called not being able to resist a sale even though you haven't the vaguest idea what you're gonna use the sale item but remembering having wished that you had bought a another sale item you hadn't but needed later. Hey... how about holding the table cloth to the folding table at the next pot luck luau? Spring clamps would probably work much better in keeping my static-hair all in one place. No wait...that there's metal in those clamps. Probably not a good idea to have metal in my hair with this humidity-less weather. Kay- the possibilities are limitless. The only thing is, "now, where did I put them" when you need to use them 20-years later. Rowena- no can. Anyways, you're got the best hair in all of Italy. Ha! Your post and comment made me chuckle. The best thing to do is not to step foot in the store in the first place, unless you have a shopping list. gigi- I got it down to 2 trips per week, max, at the grocery store. Long's (CVS), impossible, always something there. Good thing you've never been in a "real 100 yen store" in Japan! Nate- Holiday Mart (donno how to spell the store's new name) has an aisle with 99¢ items. But no, not the entire store.